What does the phrase ‘Wounded People Hurt, Healed People Love’ mean? It is a phase I coined and highlighted on the back cover of my book, Responsibility. What message was I trying to convey with this important phrase? The message is quite simple, and I have found myself using it a lot lately. Not just to remind myself but to help others navigate their own behaviors, as well as the not so desirable behaviors of others. Eckhart Tolle dedicated an entire book, A New Earth, to the subject of the ‘Pain Body’ and how we react from our wounded egos. I have often referred to people, with love and compassion, as the walking wounded. Out there in the world and their daily lives projecting, numbing, and trying without success to get rid of this pain they are carrying around consciously or subconsciously. As much as it is complicated, it is quite simple. In life we experience things that can leave us wounded; past or present traumas; past or present physical and/or emotional abuse; and past or present losses. The list is long and, unfortunately, one of the givens of life. If we are not given the opportunity to heal through loving support and guidance or education, we can bury these wounds deep into the recesses of our minds and bodies. We can try and run from them, but we can never really hide from them. They show up in how we treat and hurt others and how we treat and hurt ourselves. The wounds live on in perpetuity. Until of course we decide enough already and choose to heal ourselves; mind, body, and spirit. No easy task because it means we must dig down and mine those hurts, bring them back to life, and feel them fully, so we can ultimately release them. This is courageous work that takes commitment, dedication and a tremendous amount of strength. It takes resolve and we cannot do it alone. Remember this song, originally released back in 1965? I was barely a year old, yet the chorus lines ring as true today as they did back then, and I know and remember them. That is the thing with the truth: it is hard to forget. When we choose the courageous path to healing ourselves we find Love as the pot of gold at the end of the rainbow. We become loving to others and loving to ourselves because that is what we have to give, because that is what we now have inside us. Not hurt, pain, resentment, and anger from unhealed wounds. In my Grief Recovery Programs, we mine, we dig, we excavate, and we heal. 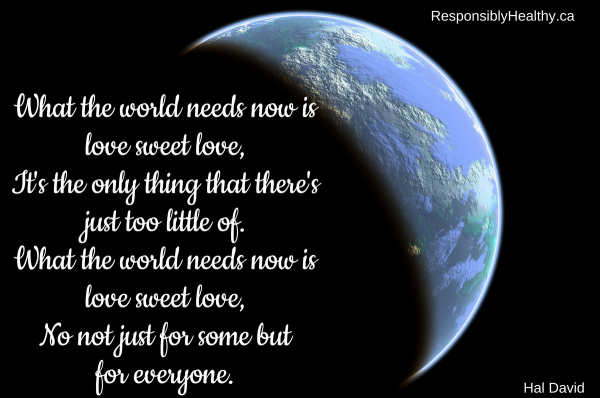 My goal with these programs is to create more love in the world because it is what we so desperately need right now. Healing yourself is your ultimate gift to yourself and the world. What is stopping you?